Oakleaf Hammock is a unique community in Ellenton where prospective buyers can see the handiwork of three major U.S. homebuilders. Its first homes were constructed by the Ryland Ground which merged with Standard Pacific in 2015 to form CalAtlantic that took over home construction in the community’s final phase. Another national builder, Lennar, then came into the picture in 2017 with its purchase of CalAtlantic that year and its realty arm getting involved in promoting Oakleaf homes for sale on the market. Oakleaf Hammock is one hotspot in Ellenton’s residential property market, based on its sold residences as recorded in the MLS of Sarasota homes for sale in 2017. There were about 60 sales in this community during the year, more than half of which consists new builds by CalAtlantic and the rest pre-owned residences built previously by Ryland. The community’s convenient location, for certain, help fuel buying interest on Oakleaf Hammock homes for sale. A gated development, this community’s main entry is at Mendoza Road just a short distance west of its junction with Victory Road. The latter corridor shortly leads south to U.S. 301 that opens an easy westward route to the Interstate 75 interchange, portal to many points of interest in Tampa, St. Petersburg and Sarasota. Buying interest on Oakleaf Hammock homes for sale is further pumped up by the community’s charming old Florida ambiance. The residences are nestled amidst lush conservation areas that provide a quiet and serene tropical setting. Each home in Oakleaf Hammock, moreover, benefits from the property’s own irrigation system. 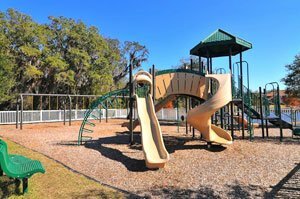 Additionally, the neighborhood is provided with family-friendly amenities which include a playground, a multipurpose field, basketball court, and picnic pavilion. 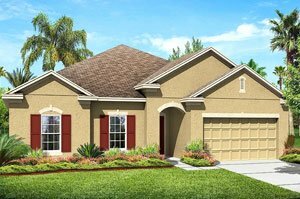 CalAtlantic, which has been absorbed as a unit of Lennar, has set six home designs for construction at Oakleaf Hammock. These models feature floor areas ranging between 2,400 and 3,850 square feet designed with three to six bedrooms. One of the top-selling Oakleaf Hammock homes for sale is CalAtlantic’s one-story Amelia design which is priced starting from the high $200s. It comes in floor plan choices of 2,256 to 2,755 square feet, featuring three to four bedrooms and two to four baths plus a two-car garage. Also one of the leading choices in this community is the two-story Siesta plan with a floor area of 3,152 up to 3,822 square feet designed with five to six bedrooms and up to five baths. Also featuring a three-car garage, renditions of this design comes with price quotes in the $300s‒$400s range. Deals on these Oakleaf Hammock homes for sale could be quickly sealed owing to the superiority of their design and construction which reflect the convergence of the network and expertise of the builders behind this community. Impetus to sales is certainly provided too by this neighborhood’s proximity to many local amenities. One of these is the Ellenton Premier Outlets featuring shops easily accessible via U.S. 301. Another notable area attraction is the municipal golf course of Buffalo Creek just a short distance north of Oakleaf Hammock. To cap it off for home-searching young families, excellent schools are also near this community, including Palmetto High and Virgil Mills Elementary. 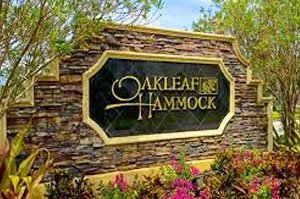 Below are the current real estate listings available at Oakleaf Hammock. Please contact me if you would like to schedule a tour of any of the listed properties below.